So happy to hear about smoothies! They are my first pick as an on the go working mother. I grab a smoothie and load it with fruits. Interesting enough I haven’t used peaches !! I will definitely try this one! I’ve turned over a new breakfast leaf, and switched up my usual oatmeal combos with smoothies. I’m now anxiously awaiting my new Vitamix, because my old blender was unhappy with the amount of frozen fruit being thrown into it everyday. 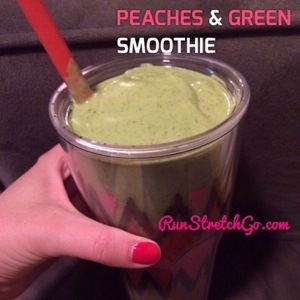 2) Blend until spinach is well mixed. And enjoy!